Is the Kīlauea Eruption Winding Down? The steaming cone at Fissure 8 with some small pockets of molten lava in the main vent area. Taken August 12, 2018. USGS/HVO. 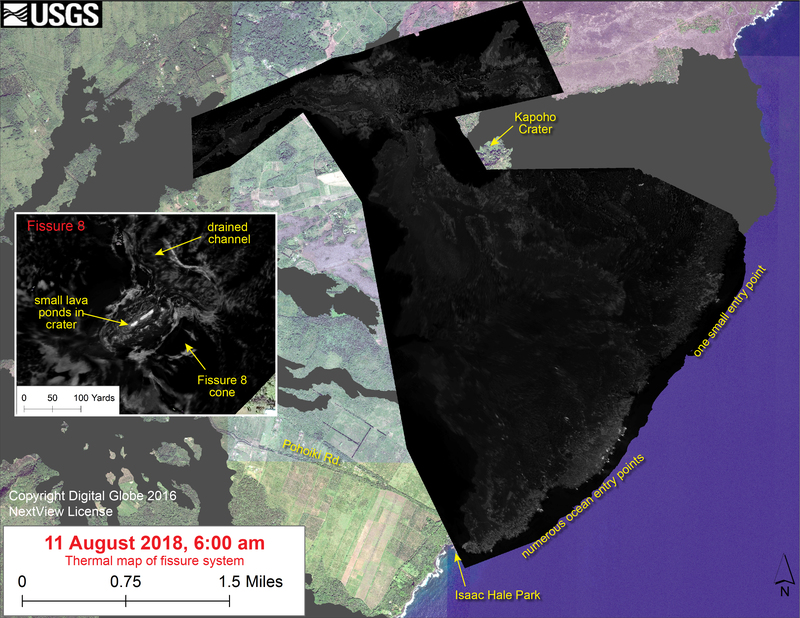 It has been awhile since I updated on the lower East Rift Zone eruption on Hawaii’s Kīlauea. Well, it appears that the eruption is slowing down significantly. The fountaining at the Fissure 8 cone has stopped (see above) and the lava lake that formed there has gotten sluggish and sticky. Does this mean we’re seeing the end of the eruption that has paved over so many homes and added to the Big Island? That is hard to say with any certainty at this point. There are still dribbles of lava making it to the ocean entry between the Kapoho Bay and Ahalanui, meaning that there is still some lava being fed into the lava tube system that has formed, all being fed by Fissure 8. However, that might be merely lava making its way through the system, so the USGS is watching closely to see if the ocean entries end altogether with this waning activity. The earthquakes and collapses at the summit seem to have slowed down sharply as well. A month ago, the summit was seeing dozens of small to moderate earthquakes each day, but now only 3 earthquakes struck on the summit on August 13. Combine that with the lowest sulfur dioxide emissions measured on Kīlauea in a decade, and all in all, it seems that something has changed over the last week. Now, it would be easy to say that the eruption is ending, but it might not be that simple. The lack of vigorous eruptions, the low sulfur dioxide, the settling of the summit earthquakes, they all point to the idea that there is less magma moving in the system underneath Kīlaeau at this moment. However, when you look at eruptions like this that have happened around the world, they can wax and wane, so this brief pause might be just that: a pause. It will take likely months of these conditions before the Hawaii Volcano Observatory would declare this eruption as “over”.